What SurveyGizmo Triggers and Actions are Supported? New Survey Response - Triggers when a new SurveyGizmo survey is submitted. 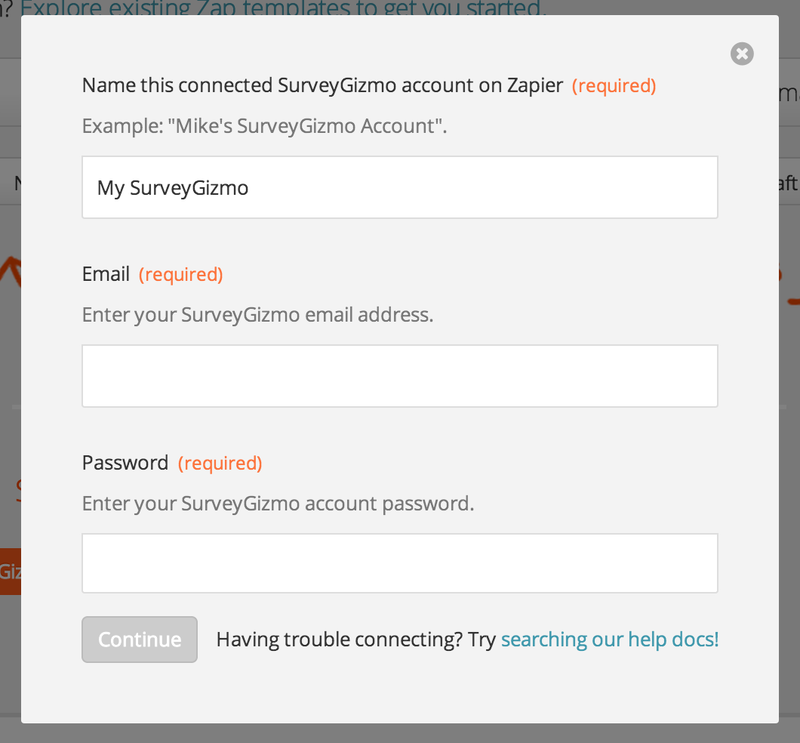 Get started using SurveyGizmo in your Zaps by choosing the trigger or action you want. Next, you'll need to connect your SurveyGizmo account to Zapier. Start by clicking the "Connect a SurveyGizmo Account" button. Give your account a name so you can easily recognize it later, and add your SurveyGizmo account email and password. Once you click the "Continue" button, the popup window will close, and your SurveyGizmo account should now be connected and ready to use in your Zaps! If you sign in at http://surveygizmo.eu or http://surveygizmo.ca, your account isn't currently supported on Zapier at this time. If you'd like to be notified when these accounts are supported, contact us and we'll be sure to let you know. If you have multiple "completion points" in your survey you'll want to make sure they all occur after a required portion of your survey is filled out. Otherwise you risk having surveys that trigger unexpectedly which may have partially complete information. This can cause your Zap to hit errors if you use that missing data in subsequent steps. Alternatively, you can remove the multiple completion points or break the survey into multiple surveys and send them separately.